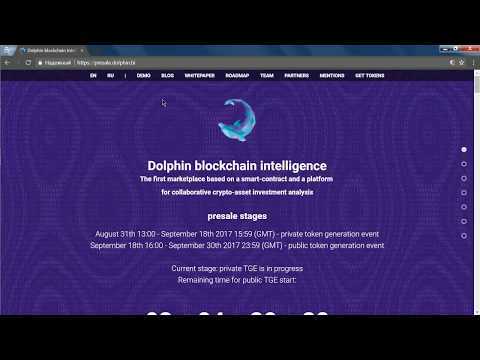 Dolphin BI is a crypto-asset investment analysis platform based on a smart-contract. It enables users (Subscribers, Authors and Experts) to establish efficient collaboration in order to enhance ICO investment analysis. We propose to create a platform where both automated analytics and sharing of expert knowledge can be applied to streamline crypto-asset analysis at each stage of ICO’s lifecycle (incubation, presale, ICO, post-ICO) and to support potential investors decision making process. Characteristic​​ is a measure of an ICO which is evaluated by machine or by expert. App/widget ​is a module which represents one or several characteristics in the user interface. Dashboard ​​is a personalized set of widgets that the user utilizes in their ICO analysis. Data provider is an analytical service which is feeding apps and widgets with relevant data. Data provider will be implemented as containers (Docker or similar) which provide scalability and isolation. a set of smart-contracts that manage Experts’ ratings, distribute reward and assign widget access rights for Subscribers (e.g. on pay-per-month basis). These smart-contracts are the foundation of the platform and are developed by Dolphin BI development team in tight cooperation with the platform community. data providers attached to apps/widgets. A data provider isn’t a distributed part of the platform and it can be created by any developer who follows the platform development guidelines. However, we expect that data providers will be open-source software. First data providers (e.g. access to blockchain data) will be developed by Dolphin BI development team as open-source software. an end-user interface, which provides easy access to the platform’s services. This interface includes a customizable dashboard with widgets, authorization and payment features, and contract upgrade voting feature. First end-user interface will take a form of website developed by Dolphin BI development team as open-source software.